Here is a good trick with a few matches which will keep your friends guessing for a long while before they finally see how the trick is done. 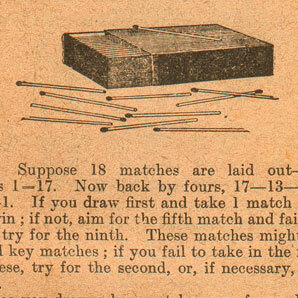 Take any number of matches; 15 will do nicely; lay them out in a row and state that you will draw one, two or three, alternately, with anyone and leave the last match for them to take every time. It is a very simple trick, when once the method of working has been explained to you, but until that time it will mystify the cleverest of heads. If you will closely observe the following rules you can win every time and run very little risk of ever failing. First know exactly how many matches are laid out, and here let it be said it is policy to change that number every few minutes (make the number more or less) otherwise your opponent will learn your moves as a parrot learns poetry. You will find when you have drawn nearly all the matches and only 5 are left, you win, because if your opponent draws 2 you do the same, if three, you take one, and vice versa. You will readily see that progress may be made throughout the play by fours, just as it was when there were five matches (four and the last one) left. Now then we count the number and mentally deducting the last match, work back by fours. Suppose 18 matches are laid out 18 minus 1 = 17. Now back by fours, 17—13—9—5—1. If you draw first and take 1 match you can win; if not, aim for the fifth match and failing that, try for the ninth. These matches might be called key matches; if you fail to take in the first of these, try for the second, or, if necessary, the third. Once you draw a key match, move forward by fours, if your opponent takes 2 you take 2, if 1 you take 3, if 3 you draw 1. Try this trick some dull evening, and you will be surprised to find how pleasantly the time will pass.